Improvement to the nineteenth-century streetscape of Charleville commended in the 1830s and gathered pace over the next half century: today the town retains much of its historical character. Holy Cross Catholic Church, clearly visible on the skyline given its elevated site, marked the final stage of development in Charleville of a Catholic institutional sector at the north end of the town (fig. 1). This grouping of buildings, sometimes referred to as a “chapel village”, includes the church, the nearby Convent of Mercy and a building that housed the first school run by the Mercy Sisters in the town, now in use as a theatre. 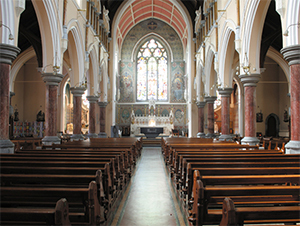 The gradual relaxation and reform of the Penal Laws and the subsequent granting of Catholic Emancipation in 1829 resulted in a boom in church building throughout Ireland. The initial impetus to provide large numbers of relatively simple buildings in which communities could worship gradually gave way to post-Famine era projects that saw the construction of larger, more ornate churches. These projects were brought to fruition through the combined efforts of the religious and lay communities. Funds were sourced at home and also further afield by accessing the Irish emigrant network. Charleville residents who worked to develop ecclesiastical architecture in the town included Margaret and Isabella Croke, key members of the Sisters of Mercy, and Thomas Croke, later Archbishop of Cashel, as well as prominent Catholic families including the Binchys, the Clanchys and the Dalys. 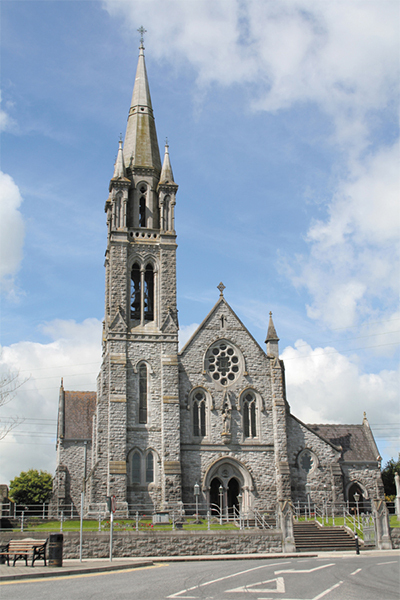 Until the opening of Holy Cross Catholic Church in 1902 by Robert Browne, Bishop of Cloyne, himself a Charleville native, the townspeople worshipped in a small chapel (1812) off the main street: a ‘neat and spacious edifice’ according to Samuel Lewis’ Topographical Dictionary (1837). In 1896 the new parish priest Reverend Patrick O’Callaghan, and his parishioners commissioned a replacement building on an elevated site at the Limerick end of the main street. While many new Catholic churches were built on virgin sites on the perimeters of towns, early Ordnance Survey maps indicate the existence of a “Zion Chapel” there. Figure 2: A view of the interior looking towards the sanctuary with the impressive “West Window” supplied (1900) by John Hardman and Company (founded 1838) of Birmingham depicting The Exaltation of the Holy Cross. Gothic Revival designs were still a popular choice for Irish churches some time after their appeal in Britain had waned and the building committee sought ‘Architects of character and respectability’ to draw up the plans. Having served as a curate at Cobh, O’Callaghan’s first choice was George Coppinger Ashlin (1837-1921), designer of many post-Famine Catholic churches nationwide, but he declined. Instead the job went to Maurice Alphonsus Hennessy (1848/9-1909), architect of several ecclesiastical commissions in Counties Cork and Limerick. Hennessy’s plan accommodated up to one thousand worshippers and was built by the Fermoy-based contractor Denis Creedon. Architectural sculpture and carving includes the use of such symbols as the Milesian Crown, an emblem that is replicated in the interior (fig. 3). The use of imagery that linked the newly confident Irish Catholics back to the country’s cultural heritage was part of a debate on ownership of the past that was ongoing between Catholic and Protestant traditions during the nineteenth century (fig. 4). 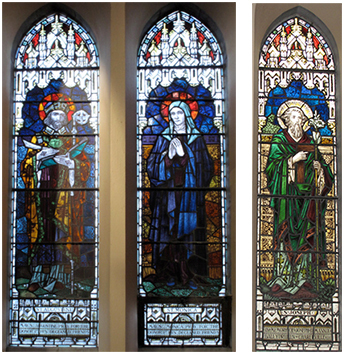 Stained glass work includes several windows from Joshua Clarke and Sons (established 1886) of Dublin, a project that was overseen by Harry Clarke (1889-1931) (fig. 5). Local and global donors are acknowledged in the dedications including the Binchy and Lincoln families. Another that illustrates the international reach of the nineteenth-century Irish Catholic Church recalls Daniel Mannix, the Charleville-born Archbishop of Melbourne, with its commemoration of ‘Joseph D. Mannix of Ballydhreen [sic. ]’ (fig. 6). The original high altar is by Earley and Company (closed 1975), the Dublin-based ecclesiastical furnishers and stone-carvers (fig. 7). 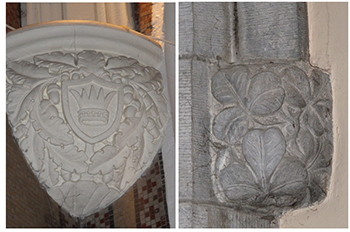 Figures 3-4: A view of the Milesian Crown-detailed label stops in the Sacred Heart Chapel. This emblem appears in a number of locations in the interior of the church and is also visible on the exterior. By 1900 just about every Irish town and village boasted a substantial Catholic church with an attendant suite of institutional buildings including convents and schools. Individually and together, they contributed significantly to the changing visual landscape of nineteenth-century Ireland and are important elements of our architectural heritage. 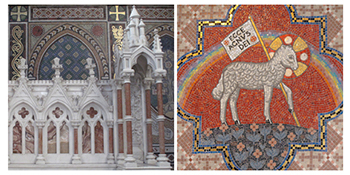 Figures 7-8: A detail of the high altar supplied by Earley and Company (closed 1975) of Dublin. Caroline M. McGee recently completed work on the Reconstruction of the Gothic Past project at Trinity College Dublin which was sponsored by the Irish Research Council for the Humanities and Social Sciences (IRCHSS). The project can be accessed at: http://www.gothicpast.com/. She blogs regularly on http://building19thcenturyireland.wordpress.com/ and her doctoral research project, Building Catholic Ireland, investigates the cost of constructing post-Famine Irish churches.